Hardback. 2nd Reprint. SIGNED. In the autumn of 1888 a series of prostitute murders in London's poverty-ridden East End caused a sensation around the world. The killer was never caught, perhaps never identified, but became known to posterity by the chilling nickname 'Jack the Ripper'. This book is the story of those murders, free of theories and speculation, by one of the world's most respected authorities on the subject. Paul's fascinatingly detailed history makes extensive use of contemporary sources to bring the reader as close as possible to the times of the crimes. The murders, police investigation and reaction of the press and the people are reconstructed chonologically, and what is known of the lives of the tragic victims is fully discussed. The crimes' social background is examined in some detail, as are the reactions of ordinary people, the growing terror, what was happening on the streets, the pressures on the police and the political crisis the crimes nearly caused. 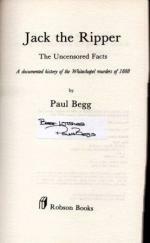 Sticking to facts and avoiding speculation and theorising, Paul takes a coolly objective look at leading police suspects, providing the reader with a meticulous analysis of what is known or can be deduced about Druitt, Ostrog and particularly Kosminski, thought to be the Ripper by the head of the CID at the time. This first edition was regarded as THE book on the subject, a primary resource for anyone interested in the Ripper mystery as well as students studying the Ripper as part of their. 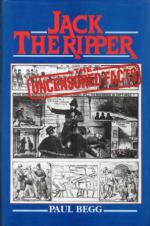 A genuine history of one of Britain's most gruesome series of murders. Illus., Appendices, Notes and References, Bibliog. and Index. 256pp. 8vo. h/back. With tipped-in label SIGNED BY PAUL BEGG. F. in Nr. F. dw.